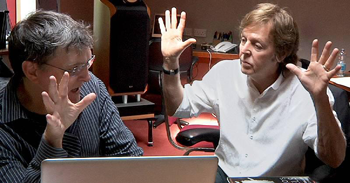 Former Beatle, Paul McCartney, may be writing music for Bungie's upcoming Marathon revival. "I'm really excited to be working on writing music with Bungie, the studio that made Halo." That's a fairly vague statement, and it isn't clear if it's connected with the project McCartney mentioned back in the beginning of the year. According to a contract that came to light during the publisher's drawn-out legal slugfest against former Infinity Ward developers, Activision has signed on Bungie to produce an unnamed science-fiction shooter franchise. The document also revealed that the developer is working on a new Marathon title, the first new installment in the series since 1996's Marathon Infinity. Though known mostly for his pop-writing chops (and, as of late, his well-documented divorce) McCartney's solo career includes numerous classical and electronica albums. It's really not too hard to imagine him scoring a videogame.